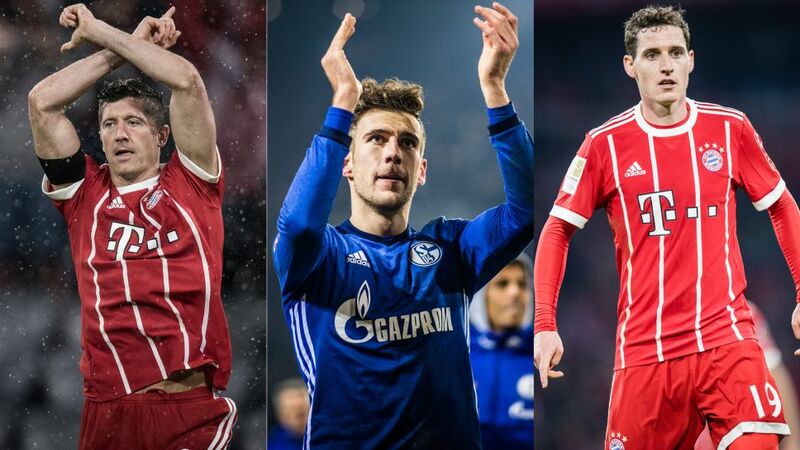 Leon Goretzka (c.) will follow in the footsteps of Robert Lewandowski (l.) and Sebastian Rudy (r.) in signing for Bayern Munich n a free transfer. Bayern Munich are one of the world’s richest clubs with pockets deeper than a philosopher’s thoughts, meaning they can compete with the very biggest bank balances when it comes to signing the planet’s most pricey players. But the Bundesliga’s record champions have shown with the likes of Philipp Lahm and Thomas Müller they can nurture fledging talent all the way into the top flight while their shrewd eye and finely tuned negotiating skills have also brought them some cut-price players who have — and perhaps will — write themselves into club legend. bundesliga.com has picked out some of the very best bargains Bayern have snapped up in recent seasons, including arguably the top freebie football has ever seen. You can measure a player’s talent by the size of his transfer fee or how fans treat him. In the case of Goretzka, one of the very hottest properties in European football, it is how the fans at Schalke, who had worshipped him throughout the Hinrunde, reacted to news he would leave Gelsenkirchen for free in the summer. The whistles aimed at the young Germany international were measured at a deafening 104 decibels during the Matchday 19 draw with Hannover, a staggering cacophony on the scale of the immense talent Goretzka has shown at the Veltins Arena. The last über-talent to make the trip was Manuel Neuer, and with their club’s headline winter addition not yet 23, Bayern fans must be feeling like it is Christmas come late. “People always think only players with a high transfer fee are good players. With Rudy, I’m convinced he’ll prove them wrong,” said club CEO Karl-Heinz Rummenigge as Bayern concluded a fee-less January 2017 deal for the Germany international midfielder, whose contract with Hoffenheim had just six months to run. The “huge strategic understanding” the former Stuttgart man has has allowed him to slot smoothly into the Bayern squad, giving head coach Jupp Heynckes greater options in midfield and allowing the club to maintain a strong challenge on all three fronts. He only turns 28 in February, giving Bayern the very best years of his talent. And all for nothing. Yes, that’s right: Lewandowski went to Bayern for free. Nothing. Not a cent. Has anyone ever done better business than Bayern when they convinced the Poland international forward his future lay with them when his Borussia Dortmund contract was running out in 2014? Probably not. Ninety-four goals in 114 Bundesliga games have followed as well as a host of individual records for Lewandowski, who will only turn 30 later this year, and Bayern will be expecting an even greater return on their non-investment in the Rückrunde and beyond. “Bayern would never sign a poor keeper as a backup for Manu [Neuer]. So it was a great honour to sign the contract,” Ulreich said when he swapped being number one in Stuttgart for the number two slot in the goalkeeping hierarchy at Bayern. While some questioned his ambition, Ulreich claimed “it was the right step” to give himself the chance to work alongside one of the best ’keepers the history of the game. “You can’t copy everything because a lot of Manu’s qualities are just gifts of God,” he stated, but Ulreich has this season been manna from Heaven with Neuer sidelined by injury, providing a solid backstop to the side. Coach Jupp Heynckes has called on Bayern to begin contract extension talks with the 29-year-old, whose current deal runs out in the summer. What bigger and better endorsement than that? His Bundesliga pedigree proven in five years at Schalke, Rafinha was an obvious choice for Bayern when — in summer 2011 — they were seeking cover for Lahm at right-back and the Brazilian had just endured a bumpy season with Genoa. Over 150 league appearances later, they cannot be regretting their minimal investment. “Rafinha is an important player on the pitch for us, but also a very well-loved figure in the dressing room,” Rummenigge stated two years ago when both parties agreed a contract extension through to 2018. “A fatal error” was how then-Stuttgart coach Alexander Zorniger described the decision to let one of German football’s brightest and best swap Baden Württemberg for Bavaria in 2015, and Kimmich quickly showed his former boss he was not wrong. A stunning first season for Bayern brought almost weekly praise from a won-over Pep Guardiola, who played his young charge at full-back, centre-back and in midfield, and earned Kimmich an unlikely place in Germany’s UEFA EURO 2016 squad. No one-season wonder, the versatile former RB Leipzig youngster has since become a bona fide Bayern and Germany first-teamer. He would have been cheap at twice whatever price Bayern paid for him, but perhaps his greatest value will come in filling the yawning gulf left by Lahm’s retirement. Bayern’s appointment of Guardiola as coach in 2013 not only heralded a change in playing style, but also the arrival of players previously unthought of by the club’s recruiters. Guardiola had insisted on signing Thiago Alcantara when he agreed to take over at Bayern, and his knowledge of La Liga also led to the arrival of Bernat from Valencia for a flatline fee as the versatile left-footer had just 12 months left on his contract with the Spanish club. Injuries have undermined his ability to exploit his full potential in Germany, but he has proven himself an excellent, reliable alternative to David Alaba when called upon. Bayern have yet to see the best of their exciting young forward, but that is only because Gnabry himself asked to be sent out on loan for the 2017/18 season. Bayern’s loss is — temporarily at least — Hoffenheim’s gain, but Gnabry will arrive at the Allianz Arena with another top-flight season under his belt, and — still currently just 22 — there is a lot more to come from the Germany international who lit up the 2016/17 season at Werder Bremen. Bayern could have had Wagner — like Mats Hummels before him — for nothing had they had more faith in his talents when he was younger. But the striker was — if media reports are to be believed — very reasonably priced for an established Germany international. What is more, he is just what Bayern had been looking for. Wagner chose the number two shirt because it was his second time round at Bayern where he had played in their youth academy, but suits his status as the long-sought-after back-up to Lewandowski. He has not been at the club long enough to have made a significant impact yet, but his 18 goals for Hoffenheim over the last season-and-a-half suggest he will provide value for money. His career stagnating at Manchester City where his debut had been delayed by a knee injury improbably aggravated by an accidental collision with an aeroplane drinks trolley, Boateng’s switch to Bayern in 2011 was a sliding doors moment in the Berlin-born defender’s life. Mostly used at full-back at former clubs Hamburg and City, the Germany international established himself as one of the world’s top centre-backs in Bavaria where — like Süle — his combination of power, athleticism and artistry with the ball at his feet have earned him, his club and his country a treasure trove of trophies. Rummenigge said “a fair and serious agreement” had been reached with Hoffenheim for their hulking centre-back in January 2017. It likely included an eight-figure transfer fee, but whatever Bayern paid their top-flight rivals for Süle, there is little doubt it was money very well spent. Just 22, the defender’s imposing physique belies a finesse with his feet that has earned him a 94 per cent pass completion rate so far this season and means he has conceded just seven fouls in 15 five-star Bundesliga appearances. Branded “a very good Bayern buy” by Heynckes, how good Süle will be at the end of the five-year deal he signed — and how valuable in the transfer market — is a mouthwatering prospect.